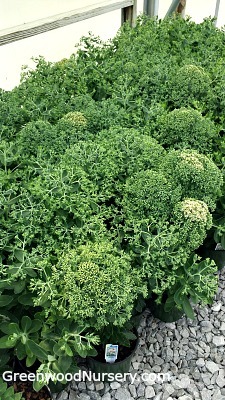 As the heat of summer takes over and most perennial plants are stressing in the garden, you'll be thrilled that you planted the Autumn Joy Sedum. This stonecrop will be reaching its height range, about mid summer completely filled with tiny green bloom buds. Then, as if magically, opening up to variations of tiny pink flowers all packed so closely together that you'd believe that they are one large blossom. These pink flower heads of the Autumn Joy Sedum age to a coral to salmon shade by end of summer only to be prepared for fall with more of a burnt red or copper color. Leave the blooms on the plant to form flower heads that will last on into winter. You can also cut them for use as dried flower arrangements. This stonecrop perennial plant is tough and grows beautifully even in dry, rocky areas. Picture shown was taken in mid July of the one gallon size plants.